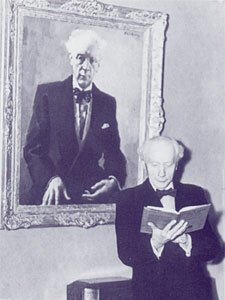 F. Matthias Alexander, in front of his portrait, perhaps reading about his discoveries in one of his books. In my previous post, To Outsource or to Insource, That is the Question – Part 1, I wrote about the moment when F. Matthias Alexander, the developer of the Alexander Technique* came to the realization that outsourcing the solution to his vocal problem was not going to work. Instead, he needed to insource, to draw on his own skills. The last doctor he had seen advised total vocal rest for two weeks and, like the everything else he had tried, it failed miserably. It was during a conversation with the doctor the next day, that Alexander made the decision to take matters into his own hand. There was of course a period of time before Alexander’s conception led to the birth his Technique. There is some question of just how long the gestation period was. Two or three years seems to be a reasonable estimate. Alexander himself provides a description of the process he went through in the remaining part of “Evolution of a Technique”. That description, along with a recapitulation of his self-experiments in Chapter 2 of his fourth and final book, The Universal Constant in Living, give us some idea of the challenges he faced, and the ingenious ways he overcame them. In some very surprising ways, his situation was a little like that of the modern physicist who wants to study the behavior of sub-atomic particles. For these physicists, traditional ideas about the “scientific method” fly out the window – including the detached observation process usually seen as a requirement for serious scientific investigation. It turns out that when a scientist observes the behavior of of sub-atomic particles, the very act of his or her observation affects their behavior. Mere observation influences what is being observed. Just imagine the difficulties that presents! Alexander was up against an equally vexing problem: he needed to observe himself in as accurate a way possible in order to judge the effects of his self-experiments. Unlike the physicist with his sub-atomic particles, whose very presence influenced their behavior, Alexander faced the problem that he was the very entity he was observing. In other words, the experimenter was the subject of his own experiments. Just imagine the difficulties that presented! In Alexander’s case, he was initially dealing with two variables: his mental intent about what he was doing, and what it felt like he was doing. It didn’t take him long to realize that his feelings about what he was doing were not accurate. He needed a way judge what was actually going on that was independent of them. Eventually, he came up with idea of using a mirror, and then several mirrors, to see what he was doing – a method that enabled him to by-pass his faulty sensory information. The mirrors gave him relatively accurate information that he was unable to get through his feeling senses. It’s not possible here to give a full account of all the strategies Alexander brought to bear on his problem. It’s well worth reading, and thinking about, the descriptions Alexander provides in The Use of the Self and The Universal Constant. Clearly Alexander went up many blind alleys before he eventually came up with a method of self-direction that would bring about useful change, and not just the illusion of useful change. All of which is to say that he had to insource in ways he had never been trained to do. Indeed that nobody had ever done before as far as he knew. Out of this odyssey of self-examination and self-discovery was born the Alexander Technique. In my next blog, I’ll explore a simple and practical, insourcing method that lies at the core of the Alexander Technique – and that makes the Technique such a powerful means of self-transformation. *It’s worth noting that Alexander never used the term “Alexander Technique”, instead referring to it as “the work”.